We help business leaders all over the world. Together we help the teams make important decisions about the new opportunities and overcome the traditional challenges. Years ago we coined the phrase - 'Let's avoid solving the wrong problem really well.' It resonated with many people. That's because we've all done it and it's still far too easy to do. Years later we coined another phrase. 'Let's see?' - and we've applied that idea to these and countless other businesses all over the world. With Structured Visual Thinking™ we help clarify business challenges - whatever they may be. As a result we can build the right plan for the future. In the process we help our client become more capable of delivering their own future. In previous lives we were clients. We ran our own businesses or worked on big transformation and change initiatives. We created the plans that our businesses need to make happen. We discovered that when it came to making plans in business - it was hard to make plans in business. We would sit through meeting after meeting and nothing would get done - so we had more meetings. We desperately needed a different way. A way that would make us think - a way that would work. We started to figure out what it means to avoid solving the wrong problems and make genuine progress. We learned to break myths and establish facts. We saw that the challenge must be clearly stated. We must solve the cause and never the effect. We made some videos to explain. We had to make the abstract jargon real. We had to figure out what would work and make what was real - deliverable. "Let's avoid solving the wrong problems really well..."
Subjective opinion and bias needed to be removed from the calculation. Those best placed to think it through needed to be involved in the thinking - everyone involved in delivering the plan had to understand and own it. The widest possible context had to be considered. The results must be built to share. We had to distinguish what mattered from what gets discussed. As we start a program of work it’s foundational for us to appreciate the context. Our work is always tethered to what we call and ‘exam question’. Thereafter every fragment of information we receive adds to our meaningful appreciation of the topic and the puzzle we call situational awareness or context. We apply frameworks throughout every assignment and at every stage. They are the evolving frames of reference and containers within which we think, stimulate and then calculate better outcomes for our clients. At each stage we will be uncovering information and helping the teams to collaborate and understand. As we bring stakeholders together we make sure they are clear about their contributions and role. The whole process unleashes thinking and creativity. The frameworks are there to inspire - free people to really think differently and solve problems. The art of conversation is something that we hold dear as humans. And yet in business it’s often the undoing of everything. Great strategic work happening in isolation of those who will have to execute is anathema to us. Because we work visually, and at pace, there is a lot of material developed and that can is typically very powerful. Especially important is to explain to people, not directly involved, what’s happening and how they can also get engaged. 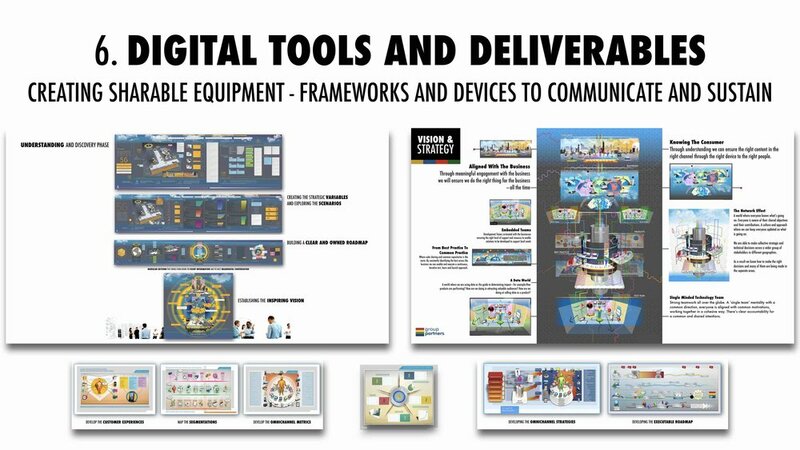 Visual summaries are powerful ways to generate engagement and confidence and alongside the development of strategy or new plans they are key deliverables at every step. 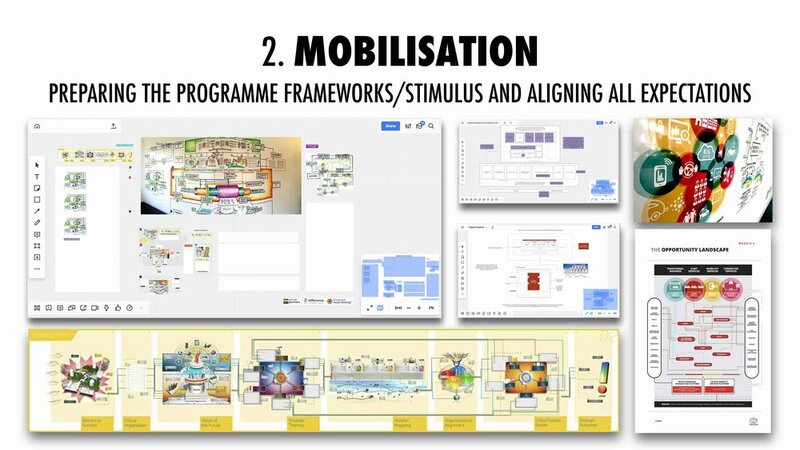 As each phase of work comes to a conclusion the enterprise needs to be communicated with or wider stakeholder groups want to understand the progress or status. Although we generate comprehensive narratives and reports we’ve proven that the images and tools carry meaningful stories far faster and to time poor executives and audiences. We work very collaboratively. We develop things visually whenever we get the chance. This means taking over big spaces and building walls. We ask for big flat painted walls - but often they aren’t available so we build them.